پرده لیلی، اگرچه در مقام‌ها و الحان موسیقی قدیم ایران نیامده‌است، ولی در موسیقی جدیدتر ایرانی، گوشه سی و سوم از دستگاه راست‌پنجگاه و گوشه بیستم از دستگاه همایون، «لیلی و مجنون» یا «لیلی مجنون» خوانده می‌شود.عزیر حاجی‌بیف آهنگساز آذربایجانی در سال ۱۹۰۸ اپرایی به نام لیلی و مجنون بر اساس اشعار فضولی نوشت که اولین اپرای جهان اسلام محسوب می‌شود. قارا قارایف نیز در سال ۱۹۴۷ یک پوئم سمفونیک به همین نام ساخته‌است.شهرام ناظری آلبوم موسیقی‌ای با عنوان لیلی و مجنون دارد. Allen, Roger M. A. (2000). An Introduction to Arabic Literature. New York: Cambridge University Press. pp. ۲۶۵. ISBN ISBN 0-521-77230-3 Check |isbn= value: invalid character (help). DE BRUIJN, J. T. P (1986) . "Mad̲j̲nūn Laylā In Persian, Kurdish and Pashto literature". The Encyclopaedia of Islam. ۵. leiden: E. J. Brill. p. 1103-1105. ISBN ISBN 9004078193 Check |isbn= value: invalid character (help). FLEMMING, B (1986) . "Mad̲j̲nūn Laylā In Turkish literature". The Encyclopaedia of Islam. ۵. leiden: E. J. Brill. p. 1105-1106. ISBN ISBN 9004078193 Check |isbn= value: invalid character (help). HEYWOOD, J. A (1986) . "Mad̲j̲nūn Laylā In Urdu literature". The Encyclopaedia of Islam. ۵. leiden: E. J. Brill. p. 1106-1107. ISBN ISBN 9004078193 Check |isbn= value: invalid character (help). Seyed-Gohrab, A.A (2009). 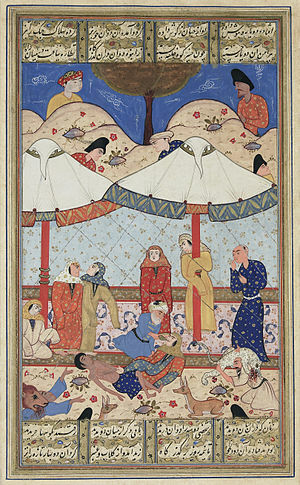 LEYLI O MAJNUN. Encyclopædia Iranica. PELLAT, CH (1986) . "Mad̲j̲nūn Laylā In Arabic literature". The Encyclopaedia of Islam. ۵. leiden: E. J. Brill. p. 1102-1103. ISBN ISBN 9004078193 Check |isbn= value: invalid character (help).